a simple supper . . .
parmesan artichoke hearts and shrimp salad for supper! We’ve been running around the last couple of days and tonight was no different. By the time I got home, it was almost six o’clock. G. was still out and had to go to another appointment before starting for home. I didn’t feel like cooking but I began when I learned G.’s arrival would be delayed. I had defrosted some frozen artichoke hearts from Trader Joe’s which I lightly dredged in flour, dipped in beaten eggs and covered with panko bread crumbs, parmesan cheese, garlic salt and parsley. While they baked in the oven, I made a favorite condiment to dip them in: Hellmann’s mayonnaise with squirts of fresh Meyer lemon. For the salad that would be our main dish, I peeled six extra-large shrimp that I had taken out of the freezer before I went to my meeting and parboiled them until tender, plopping them while they were still hot into the soy, lemon, marukan vinegar vinaigrette I had whisked up to dress the salad. I still had crisp, tender hearts of romaine that I tore up into the blue spongeware bowl, sliced up three portuguese cucumbers at a diagonal, cut up some fragrant red onion into bits and poured the rest of the maple glazed salad walnuts on top with a sprinkle of fresh cilantro leaves. When G. arrived home, I squeezed a little Meyer lemon juice on the hot artichoke hearts which we ate, dipped in the lemon mayonnaise. 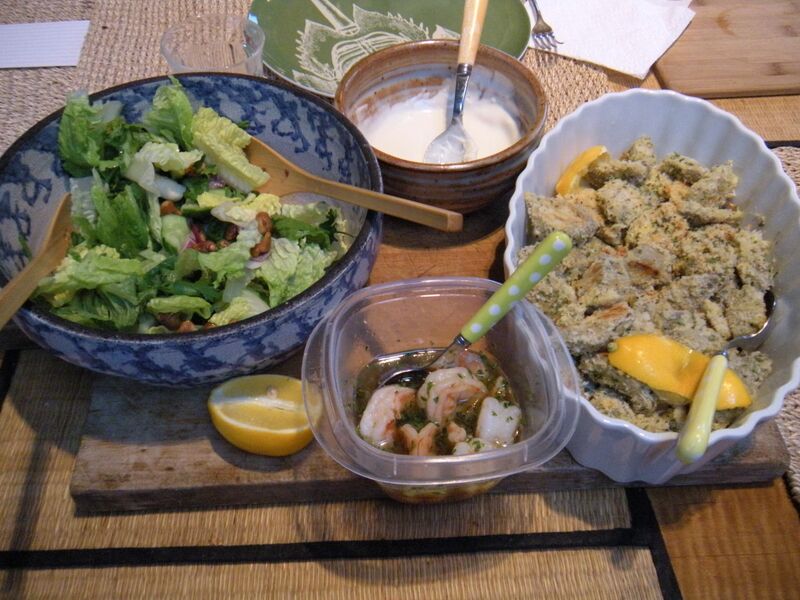 I then dressed the salad and we crunched our way through sweet walnuts, crisp romaine and tender shrimp. That’s all we had for supper. And it was good.